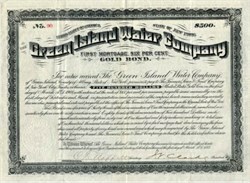 Beautifully engraved certificate from the Green Island Water Company issued in 1888. This historic document was printed by Bosford & Sons and has an ornate border around it. This item is hand signed by the Company's President (J. V. Clarke)and Secretary (C.T. Moffett) and is over 116 years old. This is the first time we have seen this certificate. Green Island, situated between Goat Island and the mainland, was named after the first park commissioner, Andrew Green. He was very prominent in New York City with the construction of Central Park, and the planning of northern Manhatten and today's Bronx. Green helped establish great cultural institutions such as the Museum of Natural History, Metropolitan Museum of Art, and the Bronx Zoo, and most importantly, led the Greater New York movement that joined the municipalities around Manhatten Island into today's 5-borough city.